So what is the legal requirement for a cruising yacht when it comes to a logbook? I don't think there is a requirement for a logbook. I certainly dont know of a requirement nor can I see one when I search. Commercial shipping maybe different. Commercial fishing has a requirement in Australia to log catches. I think your correct that most jurisdictions don’t require pleasure craft, and select other small vessels to keep & carry a Log book. In the event of accident, you may wish to present a Log book, in defense of your actions. In this case, you will want a document that can withstand hostile scrutiny. Of course, I was presuming that my log would be exculpatory. If yours not, then present not. I think the history of keeping a Ship’s Log books was to originally provide the Investors and marine department with a record of the voyage so as to form a judgement on the capabilities of the Master of a voyaging ship. Then its uses evolved in cases of collisions or actions against the Master or crew. Quite often the “Ship’s Log” is handed over by the Admiralty Judge to what are called “Elder Brethren” (retired Master Mariners with specific experience on that type of vessel) to advise him on the actions taken by the crew as recorded in the Log. If it is not Logged, then no action is assumed to have been taken! Also if the log is sloppy or there is none, it forms an opinion as to their professionalism, they advise the Judge and it will hurt their defence. I think Gord is correct, it is now only mandatory for commercial applications, but where a master’s license is at stake, it would be foolish not to keep one. my log would be exculpatory. Admiral of the Black; Barbary Coaster; Corsair; Davy Jones Locker; E. Here we go: Execution Dock; Exculpatory: "statements which tend to clear, justify, or excuse a defendant from alleged fault or guilt." yes, I use statemements like that all the time! ROTFLMAO! Well... I finally own my first sailboat. It was a journey to get to this point, but it became totally worth it on the delivery passage when we shut the motor down, raised sails... and listened to the water flow by. I ordered a log book for her, that I intended to use, but found it contained way too much extranious information... things I was likely to never use. I like the idea of keeping a log, just for sake of record keeping... and for memories, so I have designed my own logbook page which I believe has all the information I would likely record. Since this is my first sailboat, and therefore my first logbook... I would like to see if you all would take a look at it, and tell me if I am missing anything, or give other comments. Its in Google Doc's spreadsheet, and I can share it easily if people would like to have it to use, or modify for themselves. Here's a web-link to it. Not sure the link works real well in IE... sorry if it doesn't. (My blog will soon have an entry about our 5 day delivery on an unkown boat, not knowing how to actually sail, in unkown waters... and the experiences). Noticed your post about the log book template you've created in Google Docs. Are you still using this? I would very much appreciate it if you could share the doc with me so I can try it out. Thanks in advance! Did you click on his link to the spreadsheet (log) on Google Docs? It worked for me. Thanks PommyDave. Yes, I did and did see it there. However, couldn't download it. Was hoping to be able to download and use. It's Very nice to see a ship's log being consciously assembled. As with so many things in the electronic age, such is becoming a lost skill & practice, sadly. So it speaks a lot to your character. If you want a completely legal log that the authorities will not question then it needs to be as follows: It must be in a bound book and the pages must be numbered sequentially. Anything less and you could be accused of altering the log by tearing out a page or adding in a fraudulent page. Also, never block out an entry so that it is illegible. Always put a line through an error so it is readable and then initial where you crossed out the error. Your logbook does not need to describe much more than the date, time, where you are and what you are doing. If it relates to safety, then it should be logged. Logging your MOB drills is a good thing. Adding things like sea state, current and wind that relate to navigation and decisions that you had to make is beneficial. Keep your personal comments such as "It's such a pretty place" in a separate journal, and not the logbook. Extraneous entries, although cute at times, are not a good thing. It makes it look like you do not take the log entries seriously. The best logs are simple and don't have lots of columns, boxes and specific places to enter things everywhere. Having a separate engine and maintenance log is a good thing..you can have whatever format you want for that since it is only for your usage. If you want to use it to prove maintenance and upgrades performed to a buyer then a bound and numbered one with original receipts attached would be good. Your logbook is a legal document if you get dragged into court. It is also proof of your activities for many authorities. The Coasties will not recognize an electronic log over a written log. Electronic logs are too easy to alter but they are better than having nothing. I think a logbook is one place where electronics will never replace paper. How can you prove who made an electronic entry for one thing. This is very good, & prudent advice. As is much of the other info in the thread. - Who's onboard that day. It'll help folks keep track of their sea time for liscences. As well as just for memory jogs. - Who's on watch, officially. - Sail combo being flown. In addition to speed & heading; both through the water, & over ground. - Course, speed, & position; Every: Hour on the hour. Course change. Speed change. Fix or running fix. - Data, & or landmarks, etc. used to obtain said fixes. Which are handy things to know when visibility starts to disappear. Daytime or at night. Also, most of what's covered in the following threads, while archaic to some, are Key data pieces, as well as learning tools for budding sailors. As well as old hands. On Barometers, their usefulness, why, & how. Plus relevance. Truthfully, I don't use it that much. I probably should, maybe I'm too lazy. I'm working on an app for my phone that'll replace a lot of the log stuff, and maybe even pull forcasts directly etc. That link should still work... and you should be able to download it for your use. If you can't get it to work, let me know and I'll try getting it tongue in another way. Business or office supply ledgers are easily found with bound and numbered pages for a few dollars. Many of these ledgers can be found with generic columns easily adapted to your choices as a "deck log". I keep a separate "engine log" with running time and maintenance records as well as a section with at listing of important part numbers and length/diameters of lines. I'm compulsive with recording useful information. For an engine log (photo) I use a smaller, bound, but not page-numbered, book that is easily found sold as a personal "journal". These are also available for a few dollars. The nautical logs sold in marine supply stores are not easily adapted for my use and their cost is ridiculous. I use Nalgene Waterproof Laboratory Notebooks. They are bound and numbered and they are made from a synthetic paper which is totally waterproof. If you write on them with an extra fine Sharpie they will survive total immersion for decades so even if the boat sinks, the log books will be preserved for recovery. Another good source is "Write in the Rain" notebooks although they are not quite as tough as Nalgene. I have kept a daily log since I started cruising in 2002. 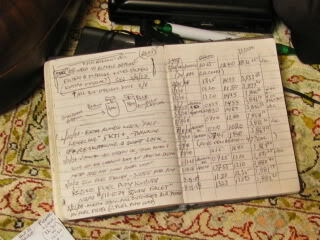 I use hard cover Collins 3880 Account Books which are described as "Minute Index". The pages are numbered. I don't keep wind or wave data or engine stuff although I do include fuel dip and consumption data. I also keep a separate maintenance log in the same type of book. Daily records include passage legs and anchorages with approximate times and any comments on unusual events or incidents. I go into detail with any incidents involving other boats including explanatory diagrams. All entries are in ink. Just the fact that you keep a daily log which records your version of any incidents will provide you with a certain amount of credibility in the event of legal problems. I'm told that if you use a laser printer with Write-In-The-Rain paper, then you can create your own, custom, waterproof logs. As such printers, evidently, melt the ink right onto whatever paper you have in your printer. So from there, it'd be a simple matter to have the custom sheets bound, to form a book. Which, when coupled with the use of a Space Pen, you're data should be pretty safe from the elements for a while. As such pens use waterproof ink, & the ink cartridge in them is pressurized. So that they will even write under water, as well as upside down or in a zero-G environment.